It is very important to note that every individual learns differently and every teacher has a different style of teaching. To this end I have created a list of possible sources to visit to learn the basics of crochet. I encourage you to try a few of the links and see which teaching style you prefer. One site may work for your friends – it does not necessarily mean it will be the right ‘fit’ for you. There are many fabulous sources online to find this information. This roundup showcases some fabulous YouTube Video Artists who offer tutorials demonstrating how to crochet. 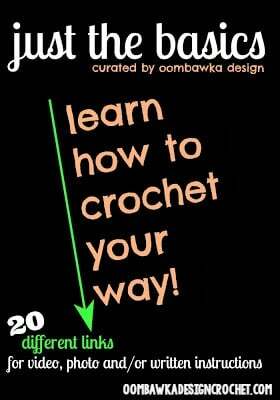 There are also numerous photo tutorials available online to teach the basic crochet stitches. When I first started to crochet – I often went to the following places to double check the proper way to crochet a basic stitch – sometimes you don’t need to see a video or to browse through an entire photo tutorial – you just need a short written, or visual reminder of how it should be done. I hope these tutorial links are as helpful to you, as they are to me. There are many, many other tutorials available online- these are really just the very tip of the ice-burg! Welcome Emily 🙂 I’m happy you found this helpful! Whooh! Thank you! I will definitely be checking out more of this tutorial section! Thank you for sharing these helpful links! You are very welcome Kathy 🙂 I’m happy I could help! A family member offered to teach me to crochet after hearing me express an interest in learning the craft. I was so excited to present my first completed square for her inspection. I only had an hour and a half or so of instruction and was a bit fuzzy on the whole turning thing. So instead of turning my work from side to side, I worked with it under my hands and then flipped it up over my hands. The square looked good and it was nicely even. I thought I had done a good job and was thrilled to have created something. My relative, after inspecting my square, asked me to demonstrate my technique. Much scorn and ridicule ensued. As there were others present to witness this, I was humiliated. I was 25. I put my needles away and didn’t pick them up again until more than a quarter of a century later. Everyone learns differently. My relative was a teacher. I guess she was absent the day that lesson was being taught. She also missed the lesson about humiliation not being the best motivator! So, fast forward 25 years. I decide, come hell or high water, that I WILL learn to crochet. I buy books. I buy a Lot of books. I get frustrated. I buy more books. Someone introduces me to YouTube. I thought I heard a heavenly choir break into songs of joy and thanksgiving! So many wonderful teachers, so many different styles of teaching, so many different ways to do the same thing! A tutorial like this, one that acknowledges that everyone has a different learning style and is willing to point you in the direction of other wonderful teachers, is the equivalent of hitting a gold mine! So, my thanks to you and all of the other wonderful people out there who take the time to photograph, video, blog and respond to questions with answers, advice and encouragement. Thanks to people like you, after only a couple of years, this 54 year old (with arthritis, no less!) has learned to crochet! Not only have I learned to crochet, I have developed the confidence to create my own designs for afghans, purses, totes, hats, scarves, headbands, tablet covers…….even an apron! The things I create are not perfect. The designs are not mind blowingly complicated. But the people that I give these things to, they are thrilled to have something that was created, from the first stitch to the last, ESPECIALLY for them. I don’t think they care that it’s not the most complicated pattern ever created or that there might be a missed stitch somewhere! And the joy and satisfaction that I get? Priceless. Thank you and all the others like you out there for giving me, a total stranger, this wonderful gift. Hi Rhondda, thanks for the great links. I'm a total beginner so these are really going to help me and just what I was looking for. Saved your blog too!